We are unable to give exact weights at this time but would envisage a whole lamb weighing approximately 17 – 20 kg. Available from October onwards – PRE-ORDER ONLY – Please contact us for further details. A whole box would include shoulder and leg joints (which can be halved or whole), the loin (as either rack of lamb and chops, or all chops), the neck (fillet, mince or scrag) and breast (whole, rolled or minced) The kidneys are also included. 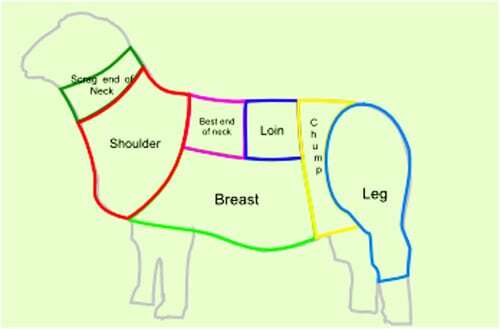 A half box would usually comprise of a shoulder and leg joint (again halved or whole), rack/chops or chops, with the neck and breast minced.